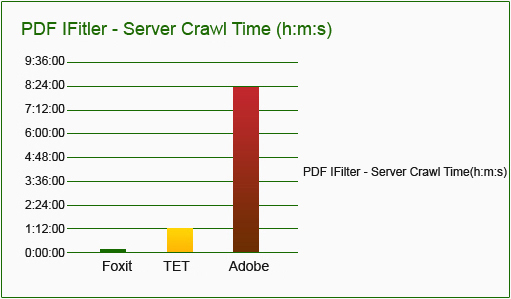 Foxit's PDF IFilter provides super-fast indexing allowing users to index a large amount of PDF documents and then quickly find desired documents by specifying search criteria. Built on Microsoft®'s IFilter indexing interface, Foxit PDF IFilter extracts data from PDF documents and returns the index results to search engine software. It goes beyond Adobe® and indexes PDF content, titles, subjects, authors, keywords, annotations, bookmarks, attachments, create time/date, number of pages, and the names of the creating applications. This results in more precise search results. PDF documents can be rapidly searched on the desktop, a corporate server, or via the Web through keywords. These PDF documents can be files, email attachments, or database records. PDF IFilter is designed to unleash the computing power of today's advanced server architectures to perform crawls at blazing speeds. Unlike other IFilter products, it takes full advantage of today's multi-core server architectures, is thread safe, and is available for both 32-bit and 64-bit operating systems - making it the absolutely fastest PDF IFilter available. PDF IFilter's superior performance and scalability reduce customers' total cost of ownership through decreased costs of server hardware, data center floor space, power and cooling, and administration. Foxit PDF IFilter supports multiple languages, including Asian languages, with ease. PDF IFilter supports indexing of ISO 32000-1 (which based upon PDF 1.7), PDF-A, and Adobe PDF files. PDF IFilter comes in two editions: a server and desktop edition. Each edition has the same advanced search features. Whether your search on a server or your desktop, Foxit PDF IFilter will provide quick and precise search results. For a complete desktop PDF solution, Foxit provides a PDF IFilter Desktop bundle with PhantomPDF™ Standard and PhantomPDF Business for easy purchasing at a special bundle price.